2128 Golf Course Dr, Reston, VA 20191 offers a unique opportunity with a 3 level bump-out extension and flexible floor plan. 2128 Golf Course Dr SOLD off-market for $550,000! Find out how much your property might sell for with our Instant Home Value Estimator. The seller of 2128 Golf Course Dr got a second chance at love and decided to move to the beach with her beau. They found their dream home on the water and it was time to get 2128 Golf Course Dr sold. The seller wanted a quick and private sale. So instead of putting the home on the MLS, we marketed the home online and directly to other top agents. We held one open house and the home was sold that weekend for full price! In the end, the buyers were neighbors who had been renting. They regularly passed by 2128 Golf Course Dr when walking their dog and referred to it as their "dream home". So when they saw that it was for sale, they jumped at the opportunity. The buyers are now living in their dream home and the seller is living happily ever after in her new love nest! Interested in a customized marketing strategy that meets your personal needs? 2128 Golf Course Dr, Reston, VA 20191 is being offered off market! 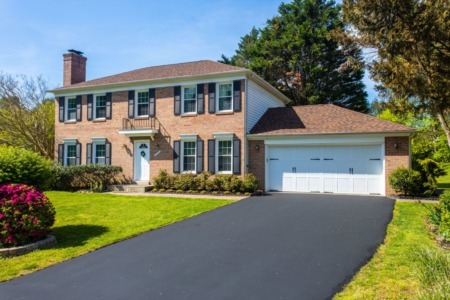 Open House Sunday, April 8th from 1-4pm. Request more info. You know when you walk into a home and it just feels right? At 2128 Golf Course Dr, you can have those warm and fuzzy feelings everyday, plus endless options for customization to best fit your lifestyle. 2128 Golf Course Dr is a special end-unit townhome with bump-out extensions on all 3 levels and is one of only 8 models of its kind in the community. Add to that hardwood floors on all three levels, renovated & expanded kitchen, expansive golf course views, walk-out full suite lower level and this home is an unrivaled opportunity. Follow the stone path to your cheery front door, passing the beautiful landscaping that bursts with color in the Spring and Summer. Enter the main level and head to the kitchen, which is a home chef and entertainer’s dream. The kitchen has been expanded and upgraded, featuring granite counters, stainless steel appliances, dual ovens, and spacious breakfast bar. The chef doesn’t have to miss any of the action as the kitchen overlooks the generous dining area/family room. The party can easily flow outside to the large custom composite deck overlooking the first hole green of Reston National Golf Course. After enjoying your fabulous meal, head to the living room with its chic exposed brick wall. Curl up with a cup of tea in front of the wood burning fireplace and let your day melt away. Rounding out the main level is a powder room and separate dining room for your more formal gatherings. Retreat upstairs and smile smugly to yourself over your amazing master suite. The ensuite bathroom is roomy with dual vanities and glass enclosed shower, and the walk-in closet plus additional closets has space for everyone. The master suite also has a large sitting room/office/nursery; whatever fits your needs! Prefer this space to be an additional bedroom instead? No problem! Switching out one door will quickly turn this back into a bedroom. Rounding out the upper level are two other well appointed bedrooms and a full bathroom which has been renovated in the last 5 years. Now it’s time to head to the lower level. Walk through the door and you will find a fabulous surprise. The lower level boasts a full kitchen, living room, full bathroom, and additional bedroom with wood burning fireplace. With its private walk-out entrance and own washer/dryer, this space is perfect for additional income, a boomerang child who just can’t quite leave the nest, relatives, or au pair. The options are endless! The french doors lead to the covered patio which offers the perfect spot to sip lemonade while critiquing the golfers’ swings. There is also an secure storage shed to keep your golf clubs and gardening tools safe and dry. Separate from the apartment-like area is a large storage/laundry room. Prefer your laundry on a different level? Don’t fret as there are laundry hookups on the main level as well! The location of 2128 Golf Course Dr is a dream for both commuting and good living. The Wiehle Metro Station is just over a mile away and there is easy access to the 267. Don’t worry about parking as two assigned parking spots await you when you return home. Take in the great outdoors with the community pool and playground just around the corner and miles of walking paths. Enjoy all of the retail, restaurants, and nightlife at the nearby Reston Town Center and take your pick of grocery stores with Safeway, Whole Foods, and Trader Joe’s all within 3.5 miles.